© 2001 Jim Dine/Artists Rights Society/(ARS), New York. Photograph by R.H. Hensleigh. With its aggressively worked surfaces and attached objects, The Heart at Sea (in a Non-Secular Way) is a reminder of Jim Dine’s artistic formation in earlier mid-century contexts of Abstract Expressionism and Neo-Dada. Joining ordinary things to expressive fields of paint, Dine joined company in the early 1960s with Jasper Johns and Robert Rauschenberg. These artists wished to reconcile art and life or, in Rauschenberg’s words, “to act in the gap between them.” This idea was the wellspring for a new sensibility in contemporary art that would be quickly known as Pop art. Dine was one of its central figures. As a painter, sculptor and printmaker, Dine took as themes Tools, Robes, Trees, and Gates, later adding Venus de Milo, Skulls, Birds, and Flowers. One of his best-known themes has been Hearts. Dine’s Heart shape, that of the Victorian valentine, is an emblem of both romantic and sexual love. He speaks of its dualistic nature, which combines the concepts of sacred and profane love. But Dine does not see the Heart as fixed in meaning. It shifts in expressiveness as it gathers resonance from its particular stylistic articulation, from Dine’s choice of title, and from immediate personal circumstances. Context is everything. 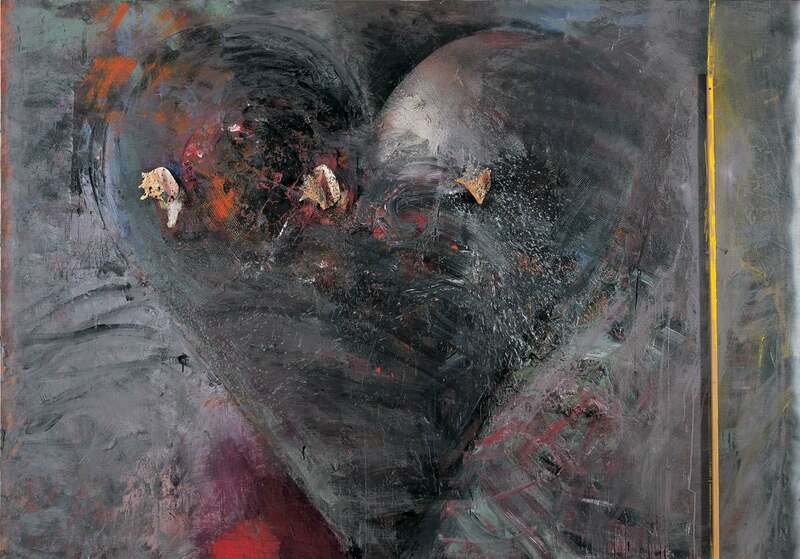 With the highly emotionalized Heart paintings of 1981, Dine declared himself an unabashed expressionist. This shift in his art joined him to a new current of neo-expressionism and to his artistic roots of the later 1950s. In a bravura handling of acrylic paints, he surrounds his monumental Heart in The Heart at Sea and nearly inundates it with agitated and sweeping gestures of color. The richly dark palette is streaked with sulphurous oranges and explosions of crimson. Dine’s motif is endangered, barely able to assert itself in the turbulence of brushwork and color. Dine force­ dried thick applications of acrylic compound with electric heaters. This resulted in cracks and fissures, a “crazing” of the surface that distressed the image. Dine also took corrugated cardboard and stamped the acrylic surfaces of the Heart. The roughened textures suggest a trampled heart and recalls, in the context of the painting’s title, an old descriptive phrase about the “wind corrugating the surface of the sea.” In truth, Heart at Sea is a marine landscape–nocturnal, tumultuous, and mythic. Dine arranged three conch shells, splashed with blue paint, in a single register across the Heart. Triton, the Greco-Roman demigod of the sea was often visualized holding a trumpet made of a conch shell, sounding it on triumphal occasions. Dine’s use of the conch shell to allude to the sea, however, is ironic. There is no cause for joy, only its brooding opposite. The conch shell was also an object used in seventeenth-century vanitas still-life paintings, taking its place beside the multitude of candles, hourglasses, wilting flowers, and skulls to remind the devout of the brevity of life and the inevitability of death. Does the somber cast of Dine’s painting spell imminent loss? Anything “at sea” is without physical or psychological bearings. If Dine’s Heart is at sea “in a non-secular way,” the forfeit may also be spiritual. But does the symbolic fact of three conch shells lend hope, a redemptive note—strengthened by the strip of wood attached to the far right of the canvas that helps anchor the composition and steady the emotional currents of paint? All of the Heart paintings of 1981 made references to troubled landscapes of the mind. They were inspired by Dine’s deep concern over the fate of a close friend who was recovering from a severe mental breakdown. Dine felt the paintings were a way of exorcising his “dear friend’s demons.” He also stated that they came “from that part of the body that is one’s ‘studio’ of the soul. “That “studio” is the human heart, and Dine’s is a compassionate one.